Lake Norman is one of the most beautiful sections of the greater Charlotte area. The community is filled with lake front properties that are in dire need of new house siding. Hatch Homes is the leading siding replacement contractor in the Greater Lake Norman area. Our company is the local contractor that is partnered with James Hardie Building Products, The manufacturer of Hardie Board Siding. Hardie recommends that all Lake Norman homeowners partner with Hatch Homes for their upcoming exterior remodeling project. As a member of James Hardie’s Contractor Alliance Program, our siding technicians receive industry-leading education and training for the installation of fiber cement siding directly from the manufacturer. This provides our homeowners with peace of mind knowing that they are receiving expert siding installation services at economically viable prices. Interested in a more affordable siding type? Hatch Homes also provides Lake Norman homeowners with Mastic vinyl siding. Our company is an elite preferred contractor for Mastic siding and it is endorsed by the VSI (vinyl siding institute) as a certified expert installer of all vinyl siding products. In addition to our siding installation services, our company also install’s new house windows and replaces roofing systems of any variety. 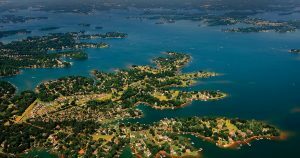 Lake Norman is a beautiful body of water that rests just north of downtown Charlotte. The lake was created by Duke Energy during the construction of the Cowans Ford Dam. Lake Norman is North Carolina’s largest body of water. The creation of the lake led to the growth of many communities that reside alongside the lake. Lake fishing is known for its fishing, restaurants and lake houses. The primary goal of Hatch Homes is to re-engineer the customer experience within the home improvement industry. While every contractor says that they’re different, Hatch Homes actually is. Are you interested in partnering with a siding specialist instead of a jack of all trades general list? If so, contact Hatch Homes today to learn more about why Lake Norman homeowners are choosing Hatch Homes more than any other local siding contractor.